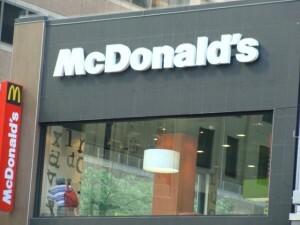 Get out of McDonald’s Corporation (NYSE:MCD) stock. It’s up more than 33% over the last two years. With info like that you might think this sizzling stock is worth owning. You would be wrong. McDonald’s has finally come to grips with the fact that people care about how they are treated. This was made painfully obvious in a recent meeting with franchisees where McDonald’s executives revealed that 20% of all customer complaints are related to “friendliness” issues. Having recognized this problem, McDonald’s Corporation (NYSE:MCD) hopes to flip this perception. To do so they are not only informing franchisees of the issue, they are also rolling out a new nationwide program to increase friendliness and customer satisfaction. Orders will now be taken in one area and picked up down the counter in another section. A new position called the “runner” has been created. This person distributes sauce, cups, happy meal toys, etc. This frees up the person taking orders from having to do this. The final person to hand the customer their meal is supposed to be friendly, thank the customer for coming, and ask them to come again. This seems like a great step for McDonald’s. The company is focusing on customer needs and addressing a major customer concern. If effectively implemented, this new approach should resonate well with customers. Back in October, McDonald’s Corporation (NYSE:MCD) posted its first sales decline in nine years and realized it was going down the wrong track. The company had been pushing its more expensive menu items, which took a bite out of sales. Since then, the company has refocused its marketing and is once again stressing cheaper items such as those on its dollar menu. The new marketing campaign launched in January, and its full impact has yet to be seen. A weak economy hurts business at all levels, even fast-food chains that sell cheap food. The economy is certainly to blame for McDonald’s failed attempt to push the more expensive menu items. It seems that McDonald’s Corporation (NYSE:MCD) was too hopeful regarding the average consumer, thinking they were ready for costlier items when they really weren’t. While the Dow Jones industrial average might be setting record highs, consumer spending is not. A Gallup survey on consumer spending indicates that spending is still down about $20 per day from pre-recession levels. McDonald’s refocused its marketing strategy in order to stress value and it’s dollar-menu items. Competitors have caught on and are now bringing the same kind of message. Fast-food companies have always competed on price and value, but this year even more so due to the fact that consumer spending has been slow to recover and people are looking to keep their expenses to a minimum. This added price competition will impact fast-food companies like Wendy’s and McDonald’s Corporation (NYSE:MCD) by driving down profits. As a result, this year’s quarterly earnings reports will likely be very disappointing for investors. Burger King Worldwide Inc (NYSE:BKW) is also getting into the value competition. After sales declined in January, it lowered the price of its Whopper Jr. to get it closer to the $1.00 category. According to Burger King, sales have rebounded in March. This move is similar to what McDonald’s did earlier this year when it refocused its marketing around less-expensive items. In Burger King’s case, though, it didn’t just refocus its marketing–the company lowered the price of one of its main items. This move endangers Burger King’s profitability going forward. While the company might have sold more Whoppers in March than in January, its profit per Whopper has gone down. Once again, it is a fast-food company that will likely see declining profits this year. This Day in History: Pfizer Inc. (PFE)’s Start, McDonald’s Corporation... McDonald’s Corporation (MCD): We Can Save It by Killing Grimace Trenders: Tesla Motors Inc (TSLA), International Business Machines Corp (IBM... Apple Inc. (AAPL) & Ten Ways NASCAR Can Teach Us How to Invest Better:... Chipotle Mexican Grill, Inc. (CMG): This Controversial Stock Keeps Crushing... Yum! Brands, Inc. (YUM): Can It Keep Growing Despite China’s Woes?